What is comprehensive wealth management? It’s the Bedel way of doing things. At Bedel Financial we define comprehensive wealth management as the alignment of a thorough plan of action for your financial future and the corresponding investment strategy to support the plan and help you achieve your goals. 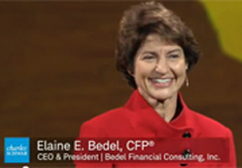 Watch the first video in our "Welcome to Bedel Financial" Video Series to learn more! What’s the key to helping clients reach the shores of financial freedom? Always putting the client’s’ needs first by following a process designed to put their minds at ease. Watch the second video in our "Welcome to Bedel Financial" Video Series to learn more! 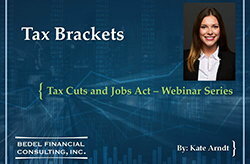 Wondering how future investing and tax strategies might be impacted by changes outlined in the TCJA? 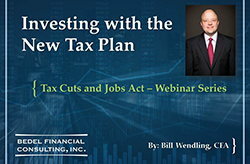 Bill Wendling, CFA, lays out what’s changed and what’s stayed the same to help you better understand if you need to adjust your strategy. 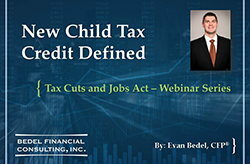 Easily one of the most hotly debated topics during last year’s tax discussions in Congress, the Child Tax Credit was substantially changed. Evan Bedel, CFP®, explains how…and what that might mean for you next year when you file. To itemize or not to itemize? That is the question. 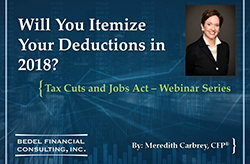 Meredith Carbrey, CFP®, discusses modifications to some of the most popular itemized deductions to help you make an informed decision come tax time. Quite a few changes with potentially big impact were made to the Estate Tax laws in the TCJA. 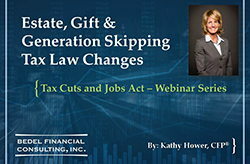 Kathy Hower, CFP®, summarizes those changes and how they might affect you in the future. What do the updated tax brackets mean for your taxes…and your paycheck? Kate Arndt breaks down the new brackets, along with cutoffs, to help you better understand where you might fall. The standard deduction has nearly doubled under the TCJA, and many may decide to no longer itemize their deductions. 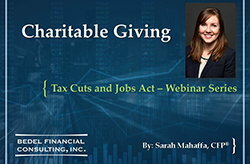 Sarah Mahaffa, CFP®, outlines options that will allow you to support the organizations you’re passionate about while reducing your tax liability at the same time! Schwab IMPACT is national, invitation-only professional conference attended by independent advisors to learn about key issues in the financial and investment industry as well as to discuss best-practices to better serve their clients. In 2014, Elaine had the honor of introducing the event at the opening ceremony. 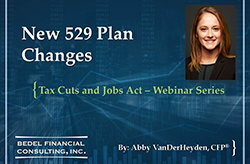 New 529 plan changes: While the changes to 529 plans aren’t nearly as large as those in some other areas, there are a few significant modifications that could impact you. Abby VanDerHeyden, CFP®, highlights the changes you should be aware of and how they might impact your education savings.